Acupuncture is a method of sending a message to the brain and spinal cord to prompt the nervous system to “fix something” by means of strategic placement of fine needles through the skin and into underlying tissue. There are two types of acupuncture point: anatomical points, which have names, and trigger points, which are spastic areas within muscles. The acupuncturist chooses a combination of anatomical points and trigger points to send a message to the nervous system based on the desired effect. 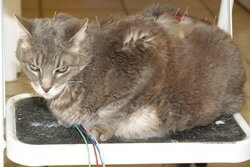 Your pet’s acupuncturist needs to be trained in animal anatomy and physiology. Taking your pet to an acupuncturist trained only to work on humans is generally ill-advised due to species-specific differences in tissue thickness and point location. At Integrative Veterinary Care, we provide acupuncture, aquapuncture, and acupressure treatment services on a daily basis.